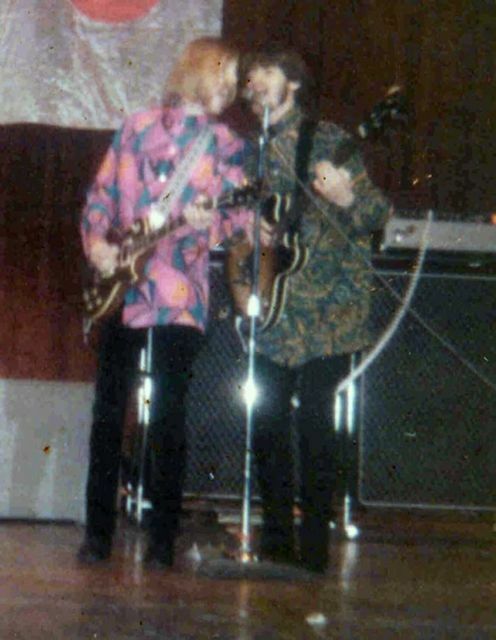 Duane was on occasions seen playing a late fifties Gibson Les Paul Goldtop around the time he played with the Hour Glass [See Photo]. The guitar was allegedly borrowed back in 1967 from Tommy “Crash” Compton, who was a friend of Johnny Sandlin. Duane never gave the guitar back and Gregg’s Wurlitzer piano was eventually traded for it. Duane had borrowed a ’59 gold top Les Paul (note – the Goldtop model was produced only until 1958) from Tommy Compton, who still lives in Decatur, and he didn’t want to give it back to Tommy. And Tommy definitely wanted it back. Eventually it worked around to Gregg trading the Wurlitzer for the guitar. The guitar was worth more than the piano but Tommy had a use for it and was trying to keep Duane from getting busted because Tommy’s dad was ready to go after Duane to get the guitar back. So, the piano was sent back to Decatur and Duane kept the guitar. Of course that guitar would be worth a fortune now, certainly more than the piano is worth. [AllmanBrothersBand forums – bigann][Anathalee G. Sandlin: A Never-Ending Groove, p. 33]. To avoid any confusion, it is perhaps important to note that this is not the same Goldtop that Duane used later on with the Allman Brothers Band since according to Galadrielle Allman [Please Be With Me, p. 182], Duane bought the second Goldtop in early to mid-1969. Also, the first Goldtop had both pickup covers and toggle switch ring, all of which were missing on the second one. What’s particularly mystifying about this guitar is what happened to it since the days of Hour Glass. In April of 1968, Duane started using a mid to late 60s Fender Stratocaster, so it is possible that this guitar ended up being traded for that one. If so, Duane traded a guitar that was not his and this could be a good reason that Gregg’s Wurlizter eventually had to be traded for Tommy’s Goldtop. If that is the case, then there must be third Goldtop since Duane was seen using one at the Atlanta Pop Festival and Love Valley Festival in 1970 (which looked different from the one he had bought in May 1969), and he reportedly used a Goldtop during the Layla sessions – which could essentially be any of them since there’s no photographic evidence of which guitar he used specifically. Of course, it is also possible that this Goldtop was not traded for a Stratocaster, and there might be the possibility that the Love Valley 1970 and Atlanta Pop Festival 1970 Goldtop could have been Tommy Compton’s. Unfortunately, currently, there’s no way to confirm any of these stories. If you happen to know anything about this guitar that would help demystify the whole thing, or you know something about Duane acquiring a third Goldtop, please be sure to leave a comment below.